Oakwood University is a private, historically black university located in Huntsville, AL, serving 1,800 undergraduate students. It was founded in 1896 and is owned and operated by the Seventh-day Adventist Church. The university was bogged down by many paper-heavy processes. The university’s legacy document imaging system lacked the ability to automate these processes, so Oakwood University turned to Laserfiche to improve efficiency, reduce paper use and eliminate ineffective manual processes. “One of our strategic goals for the next five years is to develop a culture of automation on campus. We want people to begin to identify these manual, paper driven processes themselves and look for strategic ways to automate them,” says Oakwood University CIO Kirk Nugent. One of the first processes automated with Laserfiche Forms was the graduation clearance process. Like many universities, in order to graduate from Oakwood students need to obtain graduation clearance. This involves obtaining signatures from their advisor, the registrar, etc. In the past, this process took months. Students had to carry a paper form to multiple locations around the campus to obtain a signature from each involved person. When the student obtained a signature, he made a physical copy of the form to serve as a backup in the event that the original was lost. A student would have to start this process months in advance in order to graduate on time. By re-designing the process with Laserfiche Forms, Oakwood University reduced processing time from months to just a few weeks and ensured that there was transparency throughout the entire process. The new process starts with the student filling out a Laserfiche form on the school’s website. The student enters their student ID and much of the information in the form is automatically pre-populated from the student information system, Jenzabar. Once submitted, the form is routed first to the financial aid office and then to the student accounts office for review and signatures. If a reviewer is taking too much time to complete a task, Laserfiche Forms sends the user a reminder email. If, at any step along the way, the form is rejected, the student is notified by email to contact the office and provide additional information. If the application is still rejected after that, the students gets another notification and the process ends. The vice president of academic administration oversees the process and can quickly identify bottlenecks, using Laserfiche Forms reporting tools. They can easily see if a request is being delayed, and can address the issue to move the form along. 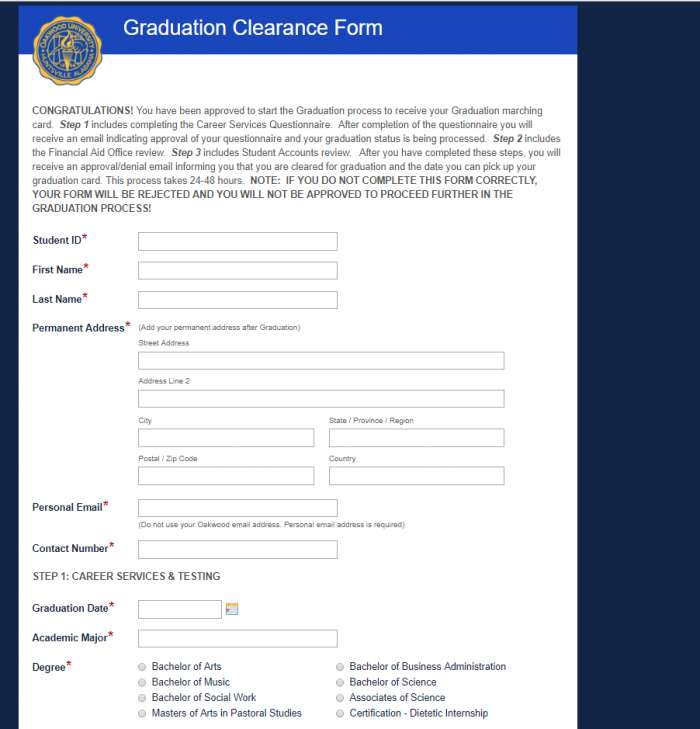 Once submitted and approved, the graduation clearance forms are stored in the student’s folder in the Laserfiche repository. Students are kept in the loop throughout the entire process with email notifications. The time to get clearance for graduation was reduced from months to just a few weeks. If the students are not cleared, they are notified more quickly so that they have time to take remedial measures and graduate on time. Advisors are not tied to their desks in order to review requests, as they have the ability to do everything from their mobile device. Students are notified throughout the entire process, eliminating trips and phone calls to the registrar’s office to confirm the status of requests.